Here's something for all Australians to be proud of - Australian art for Australian cruise ships. Yes two Australian artists have been chosen to represent their country by providing artworks for P&O’s Australian cruise ships. To get a great deal on Senior Cruises visit http://seniorcruiseholidays.com.au. "The ship, along with Pacific Jewel and Pacific Sun, is carrying art from Warren Salter and Raelean Hall, both professional artists. They may also have the chance to have their work displayed on other P&O cruise ships. The Pacific Dawn (formerly known as Regal Princess) carries 2,050 passengers in 795 cabins and 696 crew. Built in 1991, she received a multi-million-dollar refurbishment in Singapore in 2007 before beginning to operate from Australia to South Pacific destinations. 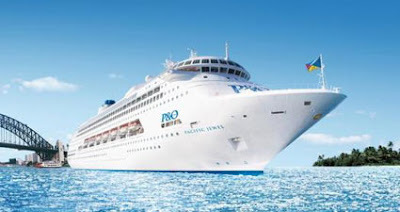 She is the first ship of the P&O Cruises Australia fleet with an all-white hull, inspired by the shape of a dolphin according to the ship’s designer, to mark P&O's 75th anniversary in Australia."